Greetings again from the darkness. A herd of wild horses frolic and gallop and relax in the prairies that separate majestic peaks of the Sierra Nevada mountain range. Suddenly the peace being enjoyed by the horses is interrupted by the deafening noise of a helicopter above. The purpose of the helicopter is to push the herd towards the corral and trucks that are part of the round-up. An opening title card informs us that more than 100,000 wild horses roam the U.S. countryside and the government is only able to manage a small percentage. Part of that process involves therapy for prisoners … an obvious analogy being the two wild beings try to tame each other. When the prisoners have trained the horses, an auction is held, and many of the animals will be used in law enforcement – an irony not dwelled upon here. Roman Coleman is a guilt-riddled man. A man of short fuse and violent ways. He readily admits to the prison psychologist (Connie Britton) that “I’m not good with people.” After 12 years in isolation, he’s been transferred to general population and he seems pretty indifferent about it. His guilt is the type that only a split-second violent outburst can saddle one with – though we don’t hear the specifics until late in the film. The psychologist assigns him to “outdoor maintenance” which is a fancy institutional term for, well, shoveling horse manure. 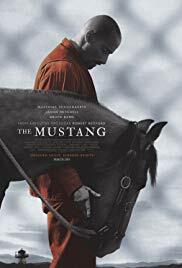 As he observes the rehabilitation program, where the convicts train the wild mustangs under the tutelage of crusty old horse trainer Myles (Bruce Dern), Roman is drawn to the wildest of the wild … a mustang kept in a dark stall and labeled untrainable. The parallels to Roman himself are obvious, and soon head trainer Myles and fellow convict Henry (Jason Mitchell, MUDBOUND) have invited Roman into the program. It’s here where man and horse prove how similar their temperaments are – they both react with anger to most any situation. After a particularly cruel and unfortunate outburst, Roman is back to solitary confinement and studying up on horses. Writer-director Laure de Claremont-Tonnerre co-wrote the story with Mona Fastvold and Brock Norman Brock (BRONSON). It’s the director’s first feature film and she shows a real knack for pacing … letting the uncomfortable scenes between man and horse breathe and play out. Speaking of uncomfortable, when Roman’s pregnant daughter Martha (rising star Gideon Adlon, BLOCKERS) shows up to get his signature on a form so that she can run off with her boyfriend, the history and lack of commonality between the two is palpable. Their scenes together are excruciating. Sure this is a cliché-filled concept, but the director and especially the cast keep us glued to the screen and caring about what happens. Matthias Schoenaerts stars as Roman, and it’s yet another stellar performance from the actor who exploded onto the movie screen with BULLHEAD (2011) and RUST AND BONE (2012). Since then, it’s been one terrific turn after another. His physical presence and soulful eyes convey so much. He has mastered the strong silent type, but here he expertly uses body language to communicate with both the horse and the audience. The drug-dealing sub-plot appears to have been included to remind us just how dangerous a prison yard can be, but we never lose sight of the pain involved with second chances and learning to be a better person. There are some similarities to two excellent 2018 movies, LEAN ON PETE and THE RIDER, but this first time filmmaker wisely lets her talented cast do their thing, as she complements their work through cinematographer Ruben Impens’ (BEAUTIFUL BOY) fabulous work up close and with expansive vistas. Robert Redford was an Executive Producer on the film, so the beauty of the area is not surprising. The film allows emotions to play out right through the final shot. Greetings again from the darkness. When “based on a true story” appears, we can usually bank on either a hero or criminal as the subject. A good person, or a bad one. With this story, we get a teenager who is basically a good kid, but one who does bad things for what he believes are good reasons. It’s likely to test your empathy and judgment. Director Yann Demange (’71) brings us the story of young Richard (Rick) Wershe, Jr through a script from writers Andy Weiss and brothers Noah and Logan Miller. We begin in 1984, the height of the “Just Say No” era, when Rick (a terrific debut by newcomer Richie Merritt) is a 14 year old living near poverty with his dad and older sister. Mom walked out years ago. Rick helps his dad in the firearm resale business (some legal, some not). Richard Wershe, Sr is played by Matthew McConaughey, who is outstanding as the dreamer who desperately wants a better life for himself and his kids. Unfortunately, the man simply lacks the capacity to do better. Sister Dawn is played by Del Powley (THE DIARY OF A TEENAGE GIRL), and Dawn is an addict who leaves/escapes home with her boyfriend. This is most definitely not “The Brady Bunch”. Detroit was in the midst of a rapid and tragic decline, and the east side where Rick lived had already hit bottom with crime, violence, drugs and poverty. Rick’s teenage resume would read firearms dealer, known gang associate, FBI informant, gunshot victim, cash-flowing drug dealer, baby daddy, rescuer of sister, and server of life sentence. It was quite a run for someone who hadn’t yet celebrated birthday number 20. This is also a story of contrasts … especially between black and white in many situations. 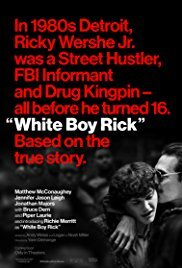 We learn the difference between ‘black jail time’ and ‘white jail time’, and the FBI obviously chose Rick because he was a white kid who infiltrated a black crime ring – he even gets invited to the local skating rink to hangout, and to Las Vegas for a Tommy Hearns fight. There is also the way Richard Sr sees himself as “above” the criminals as he protests the proliferation and danger of drugs, while then turning around and selling guns to those who peddle drugs. Selective morality. The FBI recruits Rick to feed them information by threatening to arrest his dad. He is coerced into the world of selling drugs and then later railroaded by the Feds so that they could wash their hands and walk away “clean”. Because of their influence, Rick is later sentenced to life in prison for non-violent offenses. Of course, he was surrounded by violence, and even the victim of it, but it begs the question of whether the punishment fit the crime. We are never sure if we should feel empathy for Rick, disgust at the system, or frustrated and fed up with a society that set this into motion. The supporting cast runs deep. Bruce Dern and the rarely seen Piper Laurie are Rick’s grandparents, while Jennifer Jason Leigh and Rory Cochrane play the influential FBI agents. This marks a 25 year reunion for McConaughey and Cochrane from their appearance in DAZED AND CONFUSED (1993). Also appearing are RJ Cyler (“I’m Dying Up Here”) as Rick’s friend Boo, Brian Tyree Henry as a detective, and Eddie Marsan and Jonathan Majors as drug dealers. A surprising amount of humor is mixed in with the gritty crime stuff and family struggles. There is even a comical FOOTLOOSE moment at the drive-in – providing yet another contrast between blacks and whites. Cinematographer Tat Radcliffe (“71) works wonders in some of the least appealing settings you’ll likely find in a movie, and his approach perfectly complements our personal conflicts on who to pull for throughout this quagmire. Greetings again from the darkness. Making a political statement is nothing new for movies; however, if a filmmaker takes a stance on a controversial issue, the final product needs to be insightful and compelling in order to make a difference. Seemingly intent on making a mockery of the death penalty, director Timothy Woodward Jr delivers little more than a B-movie with a hyper-serious tone, but a script that is at times laughably off the mark. Even before the opening credits roll, we get our first brutal murder … just moments after persnickety Bruce Dern belittles his wife over the sandwich she made for him. Next up, Dr. Amanda Tyler (Denise Richards) is being asked by the Assistant District Attorney to consult on the case of a death row inmate, to determine if a stay of execution should be granted. See, Dr. Tyler is a criminal psychologist. Yes, she’s played by Denise Richards. If this causes you frightening flashbacks to Ms. Richards’ role as a physicist in The World is Not Enough, then you begin to have some idea what this movie is like. The inmate is Jackson Shea (a formidable Kaiwi Lyman-Mersereau) and as he tells his life story, we are provided scenes that explain how he got to this point. It’s a pretty interesting backstory starting with sleazy Uncle Mike, an alcoholic mother, and a seemingly endless array of circumstance that might have formed the basis of a better movie. You will note many familiar faces along the way: Michael Pare as Shea’s partner, Patrick Kilpatrick as a criminal kingpin, Johnny Messner as a fellow criminal, and Emma Rigby as Shea’s love interest. For you football fans, you’ll likely reminisce about Brian Boswell when you witness Rob Gronkowski as a gun-toting bodyguard. All of this could have been good criminal fun if we weren’t being incessantly slapped upside the head with the anti-Death Penalty message … how trading death for death isn’t appropriate, and for tilting the scales to show how criminals are basically good guys who accidentally end up in a bad spot thanks to a broken system and culture of violence. It’s all a bit too heavy-handed and self-righteous, taking away some of the joy in chuckling at Ms. Richards playing it straight as an intellectual idealist. Greetings again from the darkness. If one is to believe Quentin Tarantino, the leaked script scandal nearly turned this into a novel, rather than what it clearly needed to be … a Quentin Tarantino movie (his 8th). It could even be considered a companion piece to Django Unchained (though this takes place in snowy Wyoming, as opposed to the balmy Deep South). It’s set soon after the Civil War and there still exists a palpable uneasiness between Confederate and Union types, creating a constantly teetering milieu between violence and progress. Tarantino’s obsession with classic film led him to utilize the same Ultra Panavision 70 lenses used for Ben-Hur (1959), which required the retrofitting of 50 theaters across the country for the “road show”. This presentation includes an opening musical Overture, a midpoint Intermission, approximately 6 minutes of footage that highlight this rarely used format … stunning snow-filled vistas and wide shots of the frontier, and zero previews for upcoming releases. When the film opens nationwide, the digital version will be straight-forward (though still nearly 3 hours in run time). The “road show” features are bonuses for us film geeks, and will have no impact on whether one enjoys the film or not. Rather than follow in John Ford’s majestic Western footsteps, QT has the vast majority of the story take place within a one-room set called Minnie’s Haberdashery. Thanks to a record blizzard, the general store/saloon turns into a human snake pit filled with nefarious types who are quick with a quip and a trigger. The diabolical assemblage is made up of John “The Hangman” Ruth (Kurt Russell, featuring world class whiskers), a bounty hunter who is handcuffed to his latest prize Daisy Domergue (Jennifer Jason Leigh); another bounty hunter (Union) Major Marquis Warren (Samuel L Jackson); British fancy boy Oswaldo Mobray (Tim Roth) who says he’s the hangman for Red Rock; the self-professed new Sheriff of Red Rock Chris Mannix (Walton Goggins); General Sandy Smithers (Bruce Dern), a former Confederate officer; quiet cowpoke Joe Gage (Michael Madsen); and Senor Bob (Demian Bichir), whom Minnie left tending the store in her absence. Now as you might expect, some of the above descriptions may be true, while others could be considered “conveniences”. What you also might expect is a steady rain of Tarantino dialogue delivered by the perfectly chosen cast. Each of these players grasps the cadence required to make this work … they have the rhythm of a stage play – a new direction that Tarantino has hinted at. And have no fear, over-the-top violence fills the second half of the story as the confined space and contradictory missions begin to clash. No more need be said about the characters or the story. Russell, Jackson, Goggins and Ms. Leigh are especially effective at enlivening their scenes, and they are joined by supporting actors such as Dave Parks (son of the great Michael Parks), Gene Jones (who didn’t wish to call the coin flip in No Country for Old Men), Dana Gourrier (as Minnie), QT favorite Zoe Bell (as Six-horse Judy), and even Channing Tatum. Legendary composer Ennio Morricone delivers his first western score in about 40 years, which is important since he’s the man behind the iconic music of Sergio Leone’s spaghetti westerns. On the topic of music, Morricone’s score is complimented by only a smattering of other songs (including a Roy Orbison gem and a solo from Jennifer Jason Leigh), which is unusual in the Tarantino canon. Three-time Oscar winner Robert Richardson re-teams with Tarantino and seems to have a blast with the challenges presented by the one-room set … he plays with focus and depth to create some fantastic shots. It should also be noted that the Sound is spectacular – everything from gunshots, to swirling wind, to boots and spurs, to galloping stage coach horses, and even the pouring out of coffee. All of the above results in a stunning movie experience with the anticipated QT humor, violence, and anti-racism sentiment (though the N-word usage is once again tough to take) … yet somehow the final product doesn’t equal the individual moments of genius. 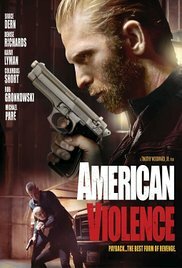 It comes across as a blend of Agatha Christie, (Tarantino’s own) Reservoir Dogs, and John Carpenter’s The Thing minus the cohesiveness required for a great movie. So enjoy the characters, the technical achievements, and the terrific dialogue, but know that it’s unlikely to be one of those that cause you to stop down while surfing cable channels in a couple years. Greetings again from the darkness. Director Alexander Payne has proved yet again that he has a remarkable eye for characters, and no need to bury those characters deep in plot. About Schmidt, Sideways, and The Descendants provided us with characters we could laugh with, cry with and feel with. His latest is his first film which he did not write, but it’s clear that he and screenwriter Bob Nelson are similar type people watchers. What you notice immediately is that this film and its characters move at their own pace. There is no rushing or urgency. They do things and say things in due time. Or not. What you also notice is that the camera does the same thing. Filmed in stark black and white, the camera is exceedingly quiet and still … just like the characters and landscape. We can thank Director of Photography Phedon Papamichael, who also worked with Payne on Sideways and The Descendants. Even the score is a bit offbeat. The blending of trumpet and guitar is rare, yet seems to fit just right. Bruce Dern is 77 years old and in his sixth decade of acting. While I have liked him quite often – and really liked him in The King of Marvin Gardens (1972) – this may be his best performance and best role yet. Dern’s Woody Grant is an alcoholic, and hard of hearing, and crotchety, and isolated. More seriously, he seems to be in the early stages of dementia given his insistence on walking to Nebraska to collect his “winnings” from a mass marketing mailing similar to Publishers Clearing House. With minimal dialogue, we “get” Woody. That’s thanks to Dern’s physical performance and ability to emote through simple gestures. We feel his quiet desperation in the search for meaning in a life that is slipping away. He just wants to be somebody before the end. The delivery mechanism is a road trip shared by Woody and his very patient son David (Will Forte). We sense David looks at the trip as an opportunity to connect for the first time with his dad, and maybe even get some life questions answered along the way. On the trip, other family members join in, including Woody’s other son Ross (Bob Odenkirk), and Woody’s colorful wife Kate (June Squibb). The trip takes them to Woody’s hometown where they cross paths with other family and old friends. Woody’s insistence that he is about to be a millionaire brings out the “true self” in those whose paths they cross. Many of his old friends are truly happy for him and wish him nothing but the best. Others aren’t so kind. True colors can be hard to watch, especially as shown by Woody’s old partner Ed Pegram (Stacy Keach), and other family members who are just after “their fair share” of the loot. The movie excels in these moments … watching a fiery Kate put these vultures in their place, while defending the husband she has spent the whole time badgering is priceless. Ms. Squibb delivers the film’s funniest lines, but she also gives a depth to Kate that adds the level of realism. Will Forte is surprisingly effective given his “Saturday Night Live” background, but we never lose sight of Bruce Dern (and his hair). The characters we see are grounded rural midwesterners who live their life from day to day, depending heavily on family and friends. Their interpersonal skills are quite different than what is found in metropolitan areas, and those born and raised in heavily populated areas may struggle to relate. The film should garner Oscar nomination consideration in multiple categories, and Mr. Dern is probably a shoe-in for a Best Actor nom. So slow down and share this trip from Montana to Nebraska … while I can’t promise a prize of one million dollars, you will definitely be rewarded. SKIP THIS MOVIE IF: your sense of humor is more likely to parallel that of Adam Sandler or Will Ferrell than Sideways or About Schmidt. Greetings again from the darkness. Well, after two viewings and endless analyzing, it’s time to commit thoughts to the page. Over the years, it has become very clear that a Tarantino movie generates a first reaction, and then proceeds to slither through your mind and morph into something else entirely. It would be very easy to accept this latest as an outrageous peek at slavery disguised as a spaghetti western. For most filmmakers, that would be plenty. The “whole” here is exceedingly impressive, but the real joy for cinephiles is in the bits and pieces. One need not be a Quentin Tarantino expert to enjoy his movies, but there are a couple of things that help. First, he is at heart, a true lover of cinema and quite the film historian, showing sincere respect to the pioneers of this art form. Second, he loves to bring visibility to issues (large and small) by poking a bit of fun at the evil doers who wield unnecessary influence and control over weaker parties. Morality, vengeance, revenge and come-uppance invariably play a role in his story-telling … a bonus this time is the inclusion of the Brunhilde/Siegfried legend from Norse mythology and the Wagner operas. In his two most recent films, QT has been on a kick for creative revisionist history. Inglourious Basterds made a strong statement against the Nazi’s, while this latest goes hard after slave owners. As you might expect, historical accuracy is less important to him than are the characters involved and the tales they weave. And to that point, it seems quite obvious that where in the past, Tarantino would center his attention on crackling dialogue and searing one-liners, he now offers up much more complete characterizations … these are people we understand, even if we don’t much like them. The obvious love he has for Sergio Corbucci and Sergio Leone, the driving forces behind spaghetti westerns, is plastered on the screen. We even get the beautiful camera work through the snow as a tribute to Corbucci’s The Great Silence (1968). While this is not a remake or sequel or prequel, Franco Nero’s “I know” response to “The D is silent” generates a laugh and memories of a 25 year old Nero in the titular role of Django (1966). The Blaxploitation genre plays a significant role here as well since Jamie Foxx plays Django, a freed slave who buddies up with a German dentist-turned-bounty hunter, so that Django can get revenge on those responsible for the torture and mistreatment of his wife. The details of the stories will not be exposed here, however, I would encourage you to pay close attention to the moments of film brilliance. There is a running gag with townspeople and slaves alike struggling to accept the sight of Django on a horse. You’ll laugh again when Django is offered the opportunity to pick out his own clothes and we next see Foxx in a velvet Little Lord Fauntleroy outfit straight out of The Blue Boy painting from Gainsborough. There is hilarious banter between Big Daddy (Don Johnson) and Betina as he tries to give guidance on how to give Django a tour of the plantation. The phrenology sequence is not just unusual, but an incredibly tense scene and fun to watch. Watching the final shootout reminds me of Peckinpah’s The Wild Bunch … only ten times as violent! Some of the best moments occur when we recognize the actors in the vital foundation scenes. Don’t miss: bad guy Bruce Dern, Don Stroud (the drummer in The Buddy Holly Story) as the ill fated sheriff, Tom Wopat as a patient Marshal (“Dukes of Hazzard”), father and daughter Russ and Amber Tamblyn, Jonah Hill who struggles with the eye holes in his “bag”, the eyes of Zoe Bell, Ted Neeley (Jesus Christ Superstar), “Dexter” dad James Remar in two roles, Walton Goggins as a gunslinger, Michael Parks (multiple roles in Kill Bill and Grindhouse), and of course, Mr Tarantino himself (as an explosive cowpoke from down under). While each of these provide wonderful moments, the real bingo occurs courtesy of the main performances of Jamie Foxx (Django), Christoph Waltz (Dr King Schultz, bounty hunter), Leonardo DiCaprio (Calvin Candie, plantation owner), and Samuel L Jackson (Stephen, Candyland house slave). Any combination of these characters in any scene could be considered a highlight. It’s especially enjoyable to see DiCaprio cut loose after so many uptight characters recently. Samuel L Jackson has long been a Tarantino favorite, and his delivery as the diabolical Uncle Tom house slave who has some secrets of his own, will bring the house down when he first sees Django and, in a much darker way, when his suspicions are confirmed. Power is a big player in the story, and even as a slave, Stephen knows what to do with power when he has it. Mr. Waltz won an Oscar for his Inglourious Basterds performance, and his dialogue here is every bit as rich. It’s obvious how much Tarantino enjoys hearing his words spoken by Waltz. Foxx’ performance could be easily overlooked, but it’s actually the guts of the film. He is quiet when necessary and bold when required. We must also discuss the soundtrack. Franco Migiacci‘s original “Django” theme is featured, as are classics and a new song from the great Ennio Morricone. If you doubt the originality of the soundtrack, try naming another western that utilizes a mash-up of James Brown and Tupac Shakur. How about a spot-on use of Jim Croce’s “I’ve Got a Name”? The film is beautifully shot by Robert Richardson, and Fred Riskin takes over for Tarantino’s long-time editor Sally Menke, who sadly passed away in 2010. It should also be noted that the script puts hip-hop to shame by using the “N-word” more than 100 times. It is a bit disconcerting, and you can google Spike Lee’s comments if you care to read more on the topic. 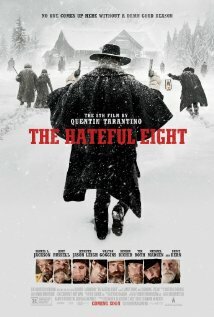 Otherwise, dig in to the latest gem from Tarantino and appreciate his approach and genius … either that, or stay away! **NOTE: I have purposefully avoided the scandal associated with the film. If you are interested in reactions from the African-American community, there is no shortage of published reports on those who support the film and those who are outraged.